The final installment in Belldene’s BLOOD VINE SERIESI’ll admit, I’ve been a fan of Belldene’s Blood Vine series from the start. If you enjoyed A Discovery of Witches by Deborah Harkness, then this series is for you. Grown-up Vampires enduring grown-up conflict.Belldene doesn’t pull any punches in this story. 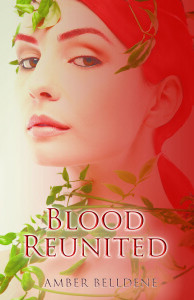 Blood Reunited is filled with angst, and romance, and my favorite kind of good-old-fashioned good-versus-evil page-turning breathlessness.What I liked about the story:Andre Maras’s youngest son Bel, half-vampire-half-human, comes into his own in Blood Reunited. He solves the age-old Vampire-versus-Hunter debate when he allows his broken heart to open up to Uta, his one true mate. Bel’s not happy about sharing anything with her, especially not his heart, but in the end Bel finds his truth in the arms of the woman he shares his blood-bond with. Watching Bel get there is an exercise in anticipation.And then there’s Uta…Oh, my dear and wonderful broken, fierce, ancient Vampire Warrior Queen, Uta. Sigh – you’ll just have to read her to understand her. She’s at once amazing, then infuriating. Hilarious, then deadly. Passionate, then desperate for the one thing she wants more than anything to justify her existence on the planet: her own infuriating Bel Maras. I also adore Belldene’s secondary characters. Pedro’s my favorite for so many reasons, but don’t tell Andre or Zoey, because I loved them too. Every character in Belldene’s beautiful Vampire world is fully drawn, with goals, understandable motivations, and severe conflicts. The vampire Loki won my heart for so many reasons. His story is one you don’t want to miss. If I’d been in charge, the Antagonist would have suffered more deeply – he certainly deserved it. Ethan Bennett was drawn as a scorpion among creeps and I dearly wish I’d witnessed him suffer more. Belldene made me want to hate him from the sidelines. And, because I found myself swept away with the plight of these wonderful souls the thing I didn’t like the most is this book ended their tale. I confess, I wanted it to go on. They will all surely be missed by this reader. All-in-all Blood Reunited has delivered a satisfying ending to a wonderful trilogy filled with paranormal characters embroiled in romantic suspense, and age-old historic battles. The sexual tension melted my e-reader, but the tender underlying love and compassion of all these characters made me cheer for the type of romances I love to read. I’ll be looking forward to more stories from Amber Belldene, regardless of genre. Treat yourself to Blood Reunited. **Disclosure: I received an ARC copy of this book for review purposes. All unbiased opinions in my review are my own. Brooding vampire halfling and biologist Bel Maras is determined to create a cure for the wasting disease that plagues his vampire family. His work becomes essential as the Hunters intensify their global and bloody campaign. When Bel’s cure fails, only his ancient and estranged godmother Uta Ilirije can help. But seeing the ice-cold Uta reveals something shocking–she is his bonded mate. She may be a dangerous warrior, but Uta feels her failures acutely. She has been unable to protect her kind from Hunters, and vampires are dying out. Worse, she tied Bel to her long ago in an accident of blood, then abandoned him for his own good–a choice he has never forgiven. Many days, she is convinced Bel and the vampires would be better off if she just walked into the sun. Biology has fated them to be mates. Now these old enemies must overcome their past to save the vampires and come to peace with the bond they never chose.